With so many diverse Greek Islands filled with stunning beaches it’s hard to pin point our favourites. But to help you out we have listed our top 25, so why not grab your beach towel, pop on your flip flops and join us as we search this olive-eating country for the most picturesque shorelines? Kavourotripes also known as Orange Beach is located in east Sithonia and offers 5 metres of stunning coastline. But this isn’t one long stretch of beach, this shoreline offers a number of small sand spots, explaining its name Kavourotripes, which translates to crab holes. This slice of coast is one of the resorts hidden gems, and is often missed by many due to its hard access. However, this isn’t always a bad thing as it is much quieter compared to the town’s additional beaches so you’re guaranteed a sunbathing spot. Although this narrow bay can get crowed in high season, it’s definitely worth a visit whilst on holiday in Rhodes. It’s considered one of the most beautiful bays here and there’s no wonder why it was the chosen backdrop of the 1961 film “The Guns of Navarone”. Just a short stroll from the main square, this beach sits below the villages stunning headland of compact whitewashed buildings. So, if you’re a fan of a beautiful backdrop you’ve picked the right sand spot. Besides being one of the island’s most popular beaches, it is also the longest beach you can sunbathe on during your holiday in Mykonos. And as the beach to be seen on during your time on the island due to its glamorous and cosmopolitan reputation, make sure you remember to pack your show-stopping swimsuit. This sandy shore is great for fishing and diving with its translucent waters, but the biggest draw has to be its glittering waters. Fancy a dip anyone? Santorini’s beaches aren’t your average white sanded shores, but this doesn’t mean that they’re any less picturesque. Located just minutes away from the ancient site of Akrotiri, this unique coloured backdrop is one of Greece’s most distinctive beaches with its red and black volcanic coated shoreline. Calm waters that invite you in, sand dunes, and unspoilt natural beauty, yes were talking about Plaka Beach. Tranquility and beauty are the two words that spring to mind when picturing this beach – Oh and Mamma Mia of course! That’s right, the chapel overlooking the beach was used in the hit film and is just as stunning in real life as it is on camera. This beaches black sand may put a lot of people off visiting, but a break to Santorini wouldn’t be complete without visiting one of its best shorelines. Protected from the wind due to the Profitis Ilias Mountain which sits high above the north side of the water, this is a real suntrap. Renowned for its lush island scenery, Paleokastritsa Beach in Corfu is no different. This enclosed spot is great for diving with it transparent waters which sit facing Corfu’s stunning coastal land. Known for its all day beach parties and loud music, this definitely isn’t the place to come if you’re looking for a peaceful spot where you can sit and read a book. This deep bay knows exactly how to get the party started, so you expect lots of bare foot dancing. As a favoured swimming spot with hundreds of beach-goers, this tropical location is backed by lush vegetation and far stretching greenery, offering some of the most scenic views on a break to Kefalonia. Picture this – going for a refreshing soak in warm waters on your Zante Holiday before stepping foot on the beaches delicate sand, pure bliss right? This quiet sandy cove is named after the white chapel that backs the beach. Fringed by pine trees there is plenty of covered areas to take advantage of if you want to escape the suns strong rays for an hour or two. Perhaps the most famous beach in Kefalonia, and one of the most photographed there’s nothing you can’t love about this seashore. Surrounded by barren cliffs and the deepest blue waters you’re in for a real Greek treat. Dig in your beach umbrella because you have made it to Agios Prokopios Beach, one of Greece’s most beautiful beaches, which offers 1. 5 kilometres of pure tranquility. We’ve finally landed on Voutoumi Beach, so if you weren’t impressed by the calm water or clifftop surroundings, the snow-white sand will definitely do the trick. Cameras at the ready because a trip to Crete’s Balos Beach offers a sight you won’t forget. This serene lagoon offers a mixed colour backdrop of pink rock and deep blue waters, and is often described as exotic due to its Caribbean-like appearance. This all-white beach is located in the north of Milos and is one of Greece’s biggest draws. The white rock that sits between the rippling water is one of the most unique backdrops you may ever witness, so don’t miss out! Often featured on numerous top beaches in Europe lists, what makes this beach so special you ask? Well, if you must know its recognition comes from its captivating landscape which lies an impressive 80 steps down. Wedding bells ring often on this bay. This pebble-meets-sand beach is a popular wedding spot with its little white chapel which sits just metres away from the bay. But if this wasn’t scenic enough the bay offers dramatic views of the village’s acropolis, which hints at the islands ancient past. Exotic views, warm waters, incredible sunsets, yes this beach has it all. It may be 347 agonising steps down, but this won’t bother you once you reach the bottom and find yourself secluded in one of the most beautiful settings. Before heading to our final seashore, just missing out on the top spot is Navagio Beach or Shipwreck Beach – as I’m sure you’ve gathered this beach has a variety of nicknames. When you arrive at this beach you’ll feel like you’ve landed on a desert island because of the huge shipwreck that sits rusting on the sand. But don’t worry this isn’t the case. Instead, you have arrived at one of Greece’s most tropical settings, which has been splatted across every holiday brochure imaginable thanks to its dramatic beauty and enclosed location. If you’re a self-professed beach bum this beach will spoil any future sandy experience. Take this as a warning because once you have witnessed it, nothing will quite compare. This beach embodies Greek beauty at its best with its gentle lapping water that entices you in and unique pinkish sand which contains thousands of broken seashells. It is these very reasons why you’ll often find Elafonissi among some of the best beaches in the world – and we can’t forget to mention its likeness to the Caribbean. 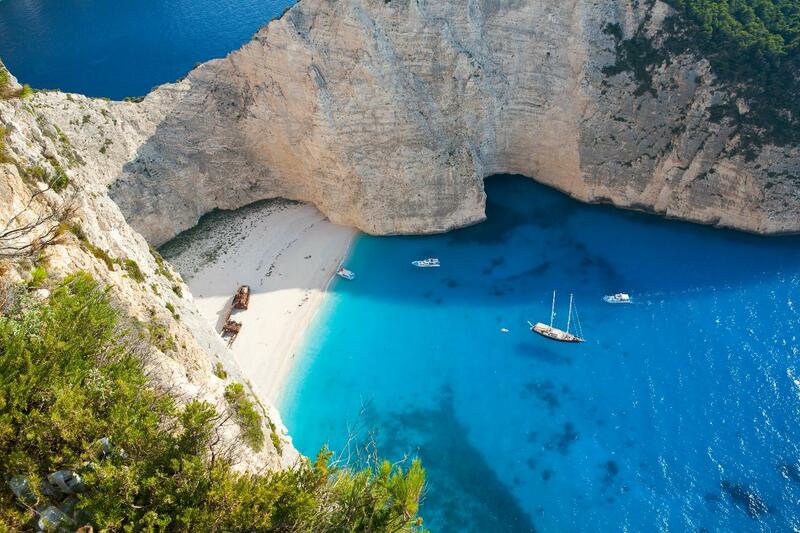 This may be our Greece beaches countdown, but which shoreline is your winner? Like this article, then you might like ‘Find Out Why These Top 7 Balearic Beaches Sizzle’.